Used in Church worship and in a private home. The Kimball Pedal Organ was used in the Bethesda Church Lewiston to accompany the singing of hymns and to provide additional music. Bethesda Church was built as a Bible Christian Chapel in 1855 and following Church union in 1900 it became a Methodist Church. There were several organists over the time including Mrs C Williams of Lewiston. Mrs Edward Weller (nee Pratt) was an organist at the time of the closure of the Bethesda Church in 1947, and she subsequently purchased the organ and used it for enjoyment in her private home. 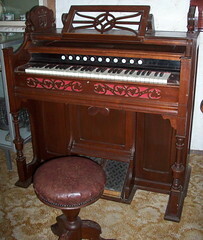 Eventually it passed into the possession of her daughter Mrs Maureen McColl of Quorn, South Australia who donated the organ to the Mallala Museum in 1998. It is now a valued exhibit at the Mallala Museum. "Life around the Light". A History of the Mallala District Council Area. Do you remember Bethesda Church Pedal Organ ? Then Join up and add your memory here.